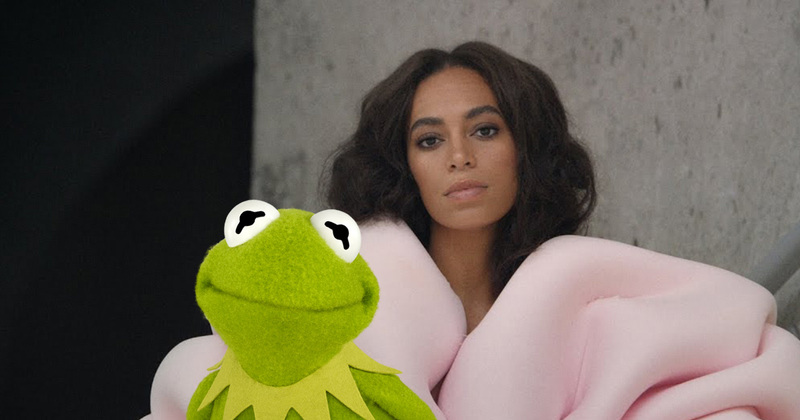 Her music might be reverential, socially conscious, and deeply important, but that hasn’t stopped someone from turning one of Solange Knowles’ songs into a meme starring Kermit the Frog. Last year, Solange Knowles released her career-defining album, A Seat at the Table. The record is a deep meditation on Solange’s experiences as a black woman, and it touches on topics of misogyny, sexism, racism, and pride. What’s more, the album debuted at number one on the Billboard album chart, and it’s pretty safe to say that we’re still obsessed with it (as are loads of these celebs). And while we’re pretty gutted that the singer isn’t going to tour the album extensively, we’re still giving A Seat at the Table pretty heavy rotation. Despite the important and emotional messages behind the songs, however, Solange hasn’t been immune to having her music turned into a meme, and this one is totally hilarious. One creative Twitter user paired lyrics from the singer’s track “Cranes in the Sky” with pictures of Kermit the Frog. The combo is so unexpectedly perfect, we’re screaming. Of course, we’ve all seen the iconic Kermit meme, and the frog puppet has become somewhat of an internet staple. Yet this might be the best use of Kermit we’ve ever seen. See the full thread below. Luckily, Solange found the whole thing HILARIOUS, and even went as far to screen grab the whole Twitter thread to share on her Instagram story. Indeed, the thread has been shared nearly 16,000 times. So, if this isn’t a hint that we need a Solange Knowles and Kermit the Frog collab as soon as possible, then we don’t know what is.